If you’re looking for a far flung family holiday, you can’t go far wrong with the Beaches Turks & Caicos Resort Villages & Spa. Situated in Grace Bay on Providenciales, it’s only a 15 minute transfer from the airport and its all-inclusive nature means you can really kick back, relax and not worry about any hidden extras. There are ten swimming pools (three with swim up bars), 20 restaurants, and accommodation to suit most family size and budget. With the exception of a few things (marked below with an asterisk) all kids’ activities are totally free, and when Space In Your Case’s Katie and Alison stayed with their families for a week, they struggled to fit everything in. But whether you have young kids who love Sesame Street or older kids who are obsessed with video games, there is something for everyone. And if you ask us, happy kids = happy parents, right? Play giant chess – what a great excuse to teach your kids how to play. Go on the inter resort train – leaving every half an hour from each village reception, it’s totally free. Play in the X Box Lounge – a welcome break from the sun, there are loads of X Box machines with pre-loaded games. Over indulge at the chocolate buffet – we missed this (sadly) but it sounded like a chocoholic’s dream. Go to the evening Sesame Street Show – we saw three shows and enjoyed them all massively. 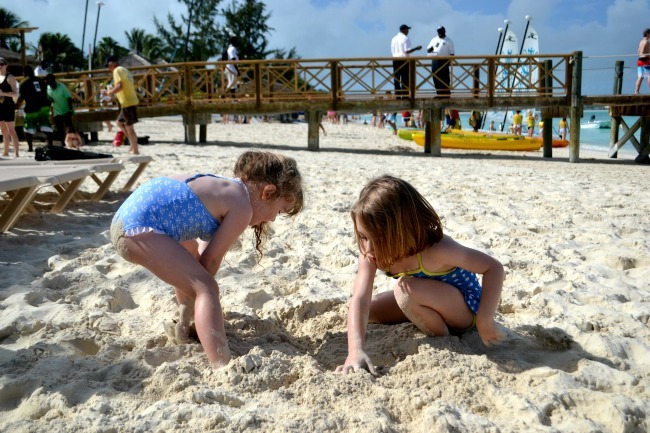 Build sandcastles on the beach – if you’ve forgotten to pack buckets and spades, you can buy them in the resort shop. Watch a movie on the big outdoor screen and eat popcorn – we watched Madagascar 3 and loved it. Make hand puppets in Camp Sesame – a must for any craft-loving child. Eat ice cream in Bobby D’s – our favourites were Rocky Road with fudge sauce or the strawberry. Play volley ball in the pool – organised games happen most days in the Caribbean village. Be pulled on mini kids’ cart* – rent a cart and pull your kids around to save their small legs. Drink a kids’ cocktail at the swim up bar – we recommend the ‘Superman’. Float down the lazy river – such a relaxing thing to do. Just be sure to avoid the waterfalls! Hang out in the kids’ jacuzzi – who says grown ups are the only ones who can have warm, bubbly fun? Watch candy floss being made in Bobby D’s – and then eat it, of course. Go bird watching with Big Bird – grab some binoculars and scope out some feathered friends. Hire board games from the activity hut – from Scrabble to Monopoly, you can rent them out, along with books and DVDs. Go under the waterfalls in the Caribbean pool – hours of fun, right there. Play at being DJs at the scratch club* – a must for tweens and teens who love music ($15 per child). Have Elmo tuck them into bed* – we guarantee this will make you smile and probably sob a bit because it’s so cute ($85 per child). Go on the Sesame Street Sail Away Catamaran Cruise* – one of our holiday highlights, this boat trip will see you dancing to Gangnam Style with Elmo and Zoe ($35 per child). Have your hair braided* – this was very popular with tween girls on the resort. Roast marshmallows at the weekly bonfire party – how many can you eat before feeling sick? Throw water balloons by the pool – they’ll be wet anyway, so being hit with a water balloon is no biggie. Eat cakes in Cafe de Paris – an amazing patisserie with beautiful bakes and hot chocolate. Buy candy from the candy store – it has the biggest pick & mix wall we’ve ever seen. Play pool games in Camp Sesame – a kids’ club with its own swimming pool? You bet. Snorkel in the sea – hire a mask and off you go. Dance at the kids’ disco – this happens on the outdoor stage and it’s the most fun party ever. Go down flumes and slides at the waterpark – our favourite one was the red slide, which you go down on a rubber ring. Whoosh! Learn about the Letter of the Day with Abby Cadabby – one of the Camp Sesame (kids’ club) activities. Play on the pirate ship in the waterpark – slides, water jets and more fun than you can shake a stick at. Tie dye your t-shirts by the pool – bring your tee along and they’ll help you do the rest. Sit on the mini armchairs in Italian Village reception watching Nick Jr – small touches like this make us smile. Take part in a beach science experiment – older kids will love this. Have your face painted – Alison’s little one had a unicorn painted on her cheek. 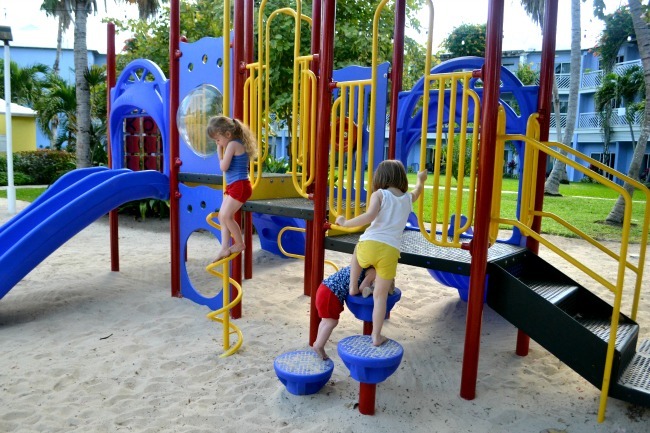 Play in the outdoor play area – your local park will never feel the same again. Go on a pirate scavenger hunt – an activity in the 5-8 year olds’ kids’ club. Do ‘Elmosize’ with Elmo – they can work up a sweat, and trust us when we say Elmo has moves! Test your movie knowledge at the kids’ movie trivia quiz – they even chuck in some questions for the grown ups. Go kayaking on the beach – or hire a giant pedalo. Play dodge ball on the French Village Lawn – the perfect activity for a cloudier day. 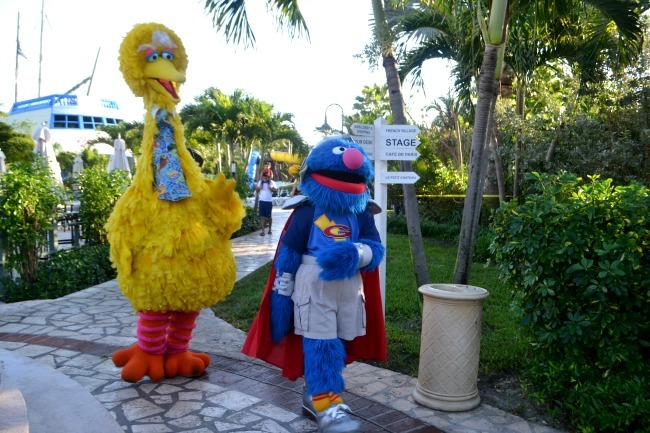 Meet your favourite Sesame Street characters as they walk around the resort – check the schedule for times of each character and have your photo taken with them. Play Soda Pong or air hockey – no prizes but a whole heap of fun. Have breakfast with the Sesame Street characters* – pancakes while hanging out with Big Bird? Best breakfast ever ($12 per adult). Watch the Sesame Street parade – a neon, musical extravaganza through the streets of the resort. Go on the tweens and teens boat trip to snorkel and swim in the sea* – fully supervised and no parents allowed ($55 per child). Go to the kids’ dance party in Club Liquid – over 5s can have their own clubbing session before the nightclub opens to the grown ups. 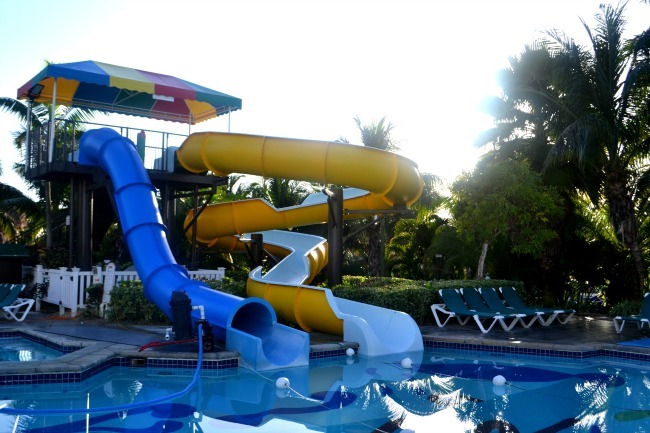 Seven nights at Beaches Turks & Caicos Resort Villages & Spa for a family of three (two adults and one child) starts from £4,885. Price includes Luxury Included (all-inclusive) accommodation, return flights from London Heathrow and resort transfers. Valid for travel from 30th August – 18th October 2015. While staying at Beaches, Turks & Caicos isn’t cheap, you could easily go and not spend a single penny all week. We spent $8 and that was only because Alison wanted to buy a nail file and lip balm from the shop. Beaches describe themselves as ‘luxury included’ and they really mean it – you can drink as many cocktails or glasses of (yummy Californian) wine as you like, and the kids can have as many ice creams as they like. The mini bars are free of charge and restocked every day, and the buffet food in the restaurants is properly delicious. The Beaches website has everything you need to know. 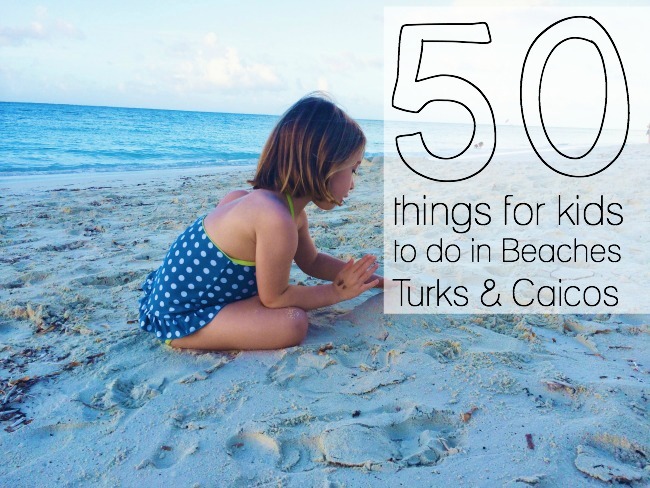 Alison and Katie were invited to stay at Beaches, Turks and Caicos for the purpose of this post – and other posts which will appear here and on their own personal blogs. 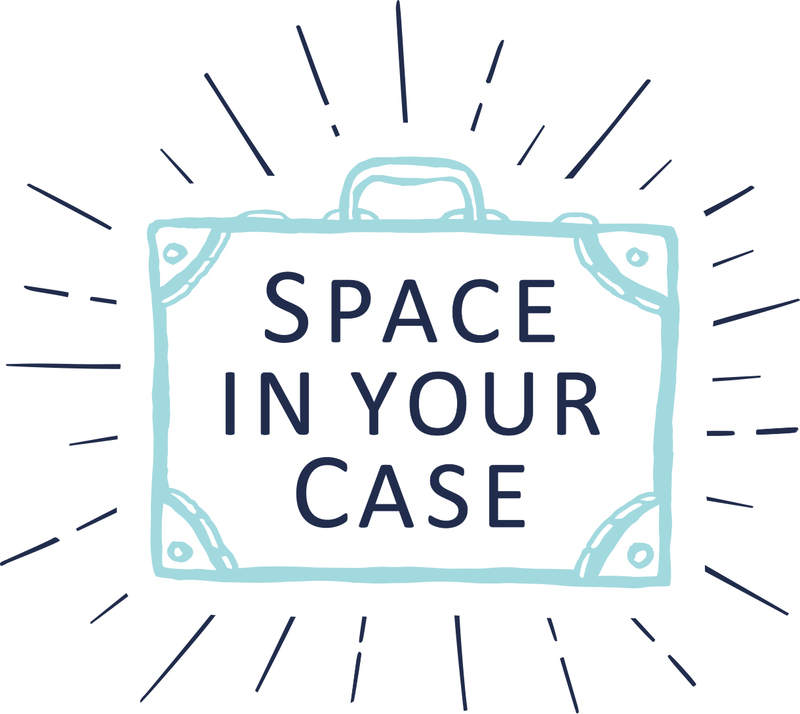 For information on how Space In Your Case works with brands, see our Work With The Team page. I have been really looking forward to seeing what you got up to. No room to get bored at all and had no idea the resort was so big – the train sounds fun! I would love to kayak – it is on Mr A’s list of promises we made him for his 40th.